A woman wakes from a nightmare, nine swords on the wall. It can be a good thing to find what you seek, except when it comes to ideas, words or problems. Find too many of them and they will overwhelm you especially, as with all the nines, you focus them on yourself. We all know this card, it is the one where we wake up at night and go over our troubles, problems, worries, thoughts, our failings, problems we haven't yet solved, ideas that went wrong, things we should not have said that we did. The querent is at the height of their anxiety, far too focused and far too critical of themselves. There is a positive aspect, however, to this waking from nightmares, which is that the querent may be seeing things out of proportion. 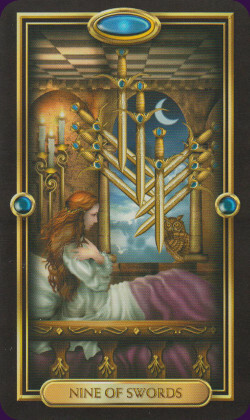 If they "wake-up," as this card suggests they can or will, they might see that things aren't so bad or unmanageable. This card could also be literal in predicting insomnia, or far too many sleepless nights alone and awake going over and over whatever worry or problem is gnawing at you. The querent's life may seem like a bad dream to them, one they wish they could wake up from. One thing is sure, however, this despair and anxiety only makes the situation worse, and offers no solutions. The querent must find a way to get out of their heads. Learn the Nine of Swords tarot card meaning and the rest of the card meanings, symbols and stories in our eBook.